Developing skin adhesives for wound care applications poses a number of challenges for manufacturers. A key challenge is to ensure secure bonding of a dressing to skin of varying health to promote healing and provide pain-free removal without skin damage. Nonsilicone pressure-sensitive adhesive (PSA) technology is customizable and promotes gentle removal. It can enable better moisture management, patient comfort, and extended wear times. This low-trauma technology is designed for advanced wound care dressings where preserving fragile skin is critical, making it well suited for daily dressing changes when a more aggressive adhesive could cause skin damage. Nonsilicone pressure-sensitive adhesives offer benefits such as better moisture management, patient comfort, and extended wear times. Evaluating wear properties of skin adhesives using a method that mimics end-use conditions is important for determining actual performance. Because it is difficult to correlate peel adhesion measured on a solid substrate to wear performance when bonded to skin, it is important to identify a substrate with similar surface energy, topography, and viscoelastic properties of skin. It is essential to test skin adhesives on human skin in order to derive reliable conclusions about the performance of that adhesive in a particular application. Designing a wear study that reflects the sample preparation, sample application, wear duration, and environmental conditions that take place during the actual application is instrumental to obtaining a consistent wear performance evaluation. This article is based on a study conducted to characterize wear properties for a range of skin adhesives. It reviews several methods used to characterize the wear properties of skin adhesives developed for wound-care and long-term wear applications. Human skin varies from person to person and is influenced by age, gender, race, diet, environment, overall health, and perspiration levels, which can range from 100–8000 mL/d. The structure, surface energy (which varies by application site), and viscoelastic properties of the skin influence how an adhesive will bond to skin, as well as how the skin will respond to removal of the adhesive. Figure 1. Shown are the 24-hour peel forces from skin for various adhesive materials. Researchers have studied peeling medical adhesives from both rigid and flexible substrates. However, because skin is not rigid, flat surface peeling of an adhesive from skin is a unique process. Skin topography, which varies with age and skin type, is also an important factor in adhesion. Different types of skin present varying degrees of roughness, which create voids where the adhesive can flow, creating mechanical anchorages that enhance peel over time. Low surface energy substrates, such as polyethylene panels, have smooth surfaces that lack the complex and rough surface of a skin substrate. Skin also has unique physical properties such as elasticity and tensile strength. Moreover, skin’s tension and retraction during movement depends on the direction, age, body posture, and location on the body. There is a direction of maximum tension, stress, and strain along the body, known as Langer’s lines.4 Langer’s lines are topographical lines drawn on a map of the human body that correspond to the natural orientation of collagen fibers in the dermis. Skin extensibility is lowest in the direction of Langer’s lines. Therefore, when a dressing or a skin adhesive patch is placed on skin, the direction of removal influences the peel force experienced and the degree of skin extension. In testing skin adhesives the peel direction should be consistent to ensure peel force data can be compared without introducing additional considerations. Silicone gel adhesives commonly used in advanced wound care applications are, in theory, a good material choice for short-term wear transdermal applications. However, they may require a minimum adhesive thickness of 80 µm to successfully bond to skin, causing a thicker edge which can snag on clothing or other materials. In general, silicone gel adhesives are susceptible to damage caused by common sterilization techniques incorporating gamma radiation that negatively impact adhesion bond levels to skin. Figure 2. Shown are the results of a 24-hour self assessment of pain. Hydrogels and hydrocolloids can also be formulated for gentle removal; however, the adhesive properties of these formats change dramatically as they absorb water, often resulting in adhesive-skin bond failure. These formats also may require a thick application of the material in a layer greater than 80 µm to ensure a reliable bond. As mentioned with silicone gel formats, a heightened edge can result in snagging and uplift of a patch. Suppliers are addressing the growing need for skin-friendly adhesives and overcoming the thickness issues of gel formats with low-trauma adhesive (LTA) platform technology for gentle removal. This high moisture vapor transmission rate (MVTR), customizable PSA technology maintains reliable, intimate skin contact for up to three days and can be removed and reapplied without the adhesive bonding to itself. The LTA formulation removes cleanly from skin without leaving any residue and is biocompatible, noncytotoxic, and nonirritating or sensitizing to skin. The LTA technology exhibits good to excellent ratings for resistance to gamma sterilization, unlike silicones, which are often unable to withstand these sterilization techniques. This nonsilicone technology can be tailored to match desired wear properties and further customized through the selection of different substrates and release liners to meet the unique design criteria in advanced wound care applications. A recent study compared the peel strength and pain levels associated with the removal of adhesive patch samples designed for 24-hour and 3-day wear in three separate studies conducted by a third party clinical lab. Twelve panelists aged 25–55 years were tested with a total of four test sites, two of which were located on each upper volar forearm. The sample adhesive patches (1 × 3 in.) were removed from the panelists’ volar forearms at the end of each wear-duration and properties such as peel force, skin irritation, and TEWL were evaluated. The skin located in the area of the test sites was not pretreated before application of the sample patches. Figure 3. Shown are the 3-day peel forces from skin for various adhesive materials. Testing 24-hour wear performance of several formulations of LTA-1 technology (LTA-1A through LTA-1D) from Adhesives Research (AR) that is specifically designed for gentle removal in short-term wear applications. This test evaluated the performance of four different adhesion levels of the LTA-1 formulation to skin to demonstrate the technology’s capability for customization. Testing three-day wear performance of AR’s LTA-3 adhesive formulation that features higher adhesion levels to skin to achieve longer wear times with low-trauma removal. 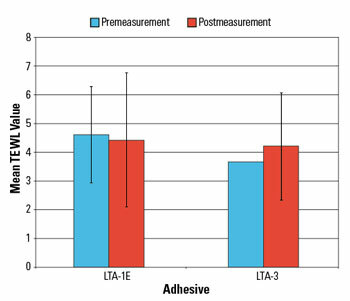 The LTA-3 adhesive was compared with samples of two commercially available reference tapes and a formulation of LTA-1 formulated with higher levels of adhesion. Figure 4. Shown are the results of a three-day self assessment of pain. Self-Assessment of Pain and Expert Grader Assessments. Preventing pain and skin stripping during removal of the patch is important for patient comfort as well as prevention of further skin damage. Epidermal stripping due to aggressive adhesives can lead to increased infection rates, hospital reportable incidences, and larger wound size. In this study, panelists were asked to rate the pain upon removal of each tape using the Wong-Baker FACES pain scale, which ranges from 0 (no hurt) to 5 (hurts worst), and a visual analog scale. In addition, test sites were evaluated for erythema and edema by an expert grader, approximately 30–45 min after each tape was removed using a scale ranging from 0 (none) to 8 (marked erythema, edema, possible erosion). Product Removal. The sample patches were removed at a 90° angle at a rate of 300 mm/min. The maximum force, mean force over the plateau region, and the area under the curve were measured. The LTA platform technology enables customization of peel properties and pain during removal depending upon the application. This set of LTA samples was formulated to target gentle removal after 24 hr of wear time through the fine-tuning of peel force. All the samples, LTA1-A through LTA1-D, are based on the same LTA base chemistry but with tailored properties. The peel forces measured upon removal (Figure 1) indicate that the LTA platform can be formulated with tailored adhesion levels of nonwoven sample patches for 24-hour wear. Pain scores at removal for all the LTA-1 platform samples during the 24-hr wear time were low despite the high adhesion levels to skin (Figure 2). The pain ratings measured as low as 0 for most panelists. Variations in skin structure, fragility, and differences in each person’s pain threshold make measurement of pain levels upon sample removal challenging. Comparison of pain levels measured for these samples showed that low pain ratings and a targeted gentleness can be achieved for LTA-1 samples for 24-hour wear without compromising skin adhesion. Figure 5. Shown are the results of a TEWL assessment. Longer wear times require higher adhesion levels to prevent minimal edge lift during wear. However, skin adhesion becomes more challenging with extended wear applications due to increased exposure to skin shedding and perspiration. 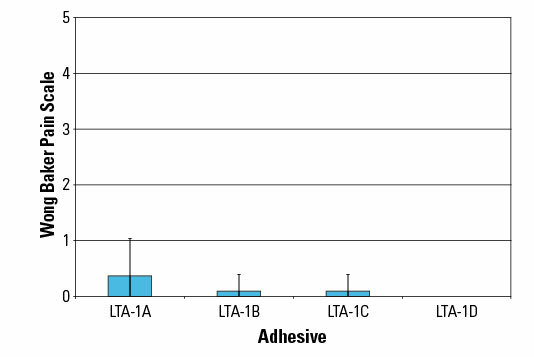 The adhesive samples evaluated in the 3-day wear study include two LTA platform samples (LTA-3 and LTA-1E) designed to present higher adhesion levels with gentle removal and two commercially available reference tapes. 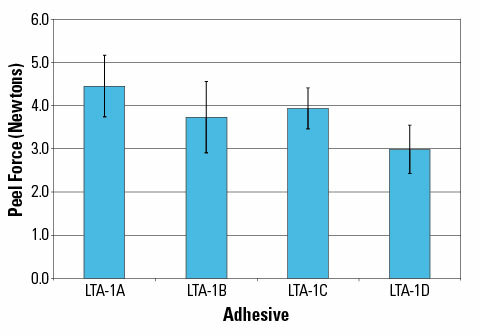 The study demonstrates that the adhesion levels and peel values of the LTA platform samples are tailorable to be comparable to competitive adhesives for the 3-day wear time (Figure 3). The LTA samples prepared with the nonwoven and polyurethane substrates provided the desired peel value range to show the flexibility of the LTA format not only by customizing the adhesive formulation, but also through the selection of substrate and release liner materials. The pain ratings at removal for all the LTA platform samples developed for 3-day wear time were low (Figure 4). 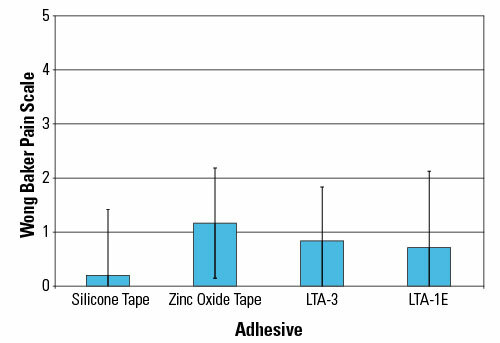 The LTA-1E and LTA-3 pain ratings are comparable to the two reference tapes, indicating that the LTA samples are suitable for applications where gentle removal is required. TEWL measurements did not indicate a significant change following the removal of the LTA sample patches (Figure 5). These results suggest that the low-trauma samples were not disruptive to skin and did not cause significant skin stripping. Developing adhesives for wound care applications is difficult in terms of obtaining excellent bonding while balancing other properties such as pain level upon removal, edge lift, and skin irritation. Therefore, it is essential to identify and characterize all these properties during the development of a skin contact adhesive. A customizable PSA platform targets moisture management, patient comfort, and extended wear times. Wear performance of these new adhesive technologies having various adhesion levels were tested on healthy humans to determine the wear performance over 24 hours and three days of wear time. The results showed all samples removed cleanly from skin with a pain index lower than 1.5 on the Wong-Baker FACES pain scale. TEWL measurements taken before and after sample removal indicated no significant difference suggesting that the samples were not disruptive to the stratum corneum layer. The nonsilicone, skin-friendly adhesives presented good to excellent ratings for resistance to gamma sterilization, unlike silicones, which are often unable to withstand these sterilization techniques. The LTA technologies may be of interest to wound care and device manufacturers seeking high-performance, nonsilicone technologies that are customizable in chemistry, substrates, and release liner selection to meet their unique design criteria. 1. Peter Pugliese, Physiology of the Skin II (Carol Stream, IL: Allured Publishing Company, 2001). 2. CT Hess, Skin and Wound Care, (Philadelphia: Wolters Kluwer, 2008). 3. J Nuutinen et. al., “Water loss through the lip, nail, eyelid skin, scalp skin and axillary skin measured with a closed chamber evaporation principle,” British Journal of Dermatology 148 (2003): 839–841. 4. Glenn Irion, Comprehensive Wound Management, (Thorofare, NJ: Slack Inc., 2010). 5. M Mündlein, et. al., “Comparison of transepidermal water loss (TEWL) measurements with two novel sensors based on different sensing principles” Sensors and Actuators A: Physical 142, no. 1 (2008) 67–72. 6. JC Cohen, et. al., “Comparison of closed chamber and open chamber evaporimetry,” Skin Research and Technology 15 (2009) 51–54. 7. GL Grove, et. al., “Comparative metrology of the evaporimeter and the DermaLab TEWL probe,” Skin Research and Technology 5 (1999)1–8. 8. GL Grove, et. al., “Computerized evaporimetry using the DermaLab TEWL probe,” Skin Research and Technology 5 (1999) 9–13. 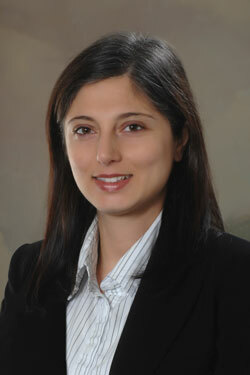 Gozde Karabiyik is product development chemist in medical and pharmaceutical R&D at Adhesives Research (Glen Rock, PA). She has been with the company for three years. Karabiyik holds a doctorate degree in macromolecular science and engineering from Virginia Tech, a master’s degree in materials science and engineering from Sabanci University (Istanbul), and a bachelor’s degree in chemistry from Izmir Institute of Technology. Contact her at [email protected].